"Explore the noxious Nightmare Fractal". And why not. 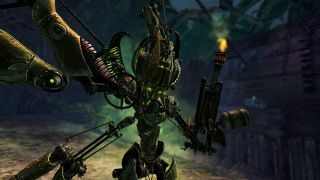 The third episode of the third season of the third...wait, no the second Guild Wars game began a few days ago, as detailed on the official site here. A Crack in the Ice is appropriately wintry, as it's set in the northern part of the Shiverpeaks: a place that will bring you closer in your quest of learning more about those pesky Elder Dragons. Explore the "noxious Nightmare Fractal", make a "legendary" new chum, and construct a cracking new shield named, improbably, "Shooshadoo". Shoosha-do you like the look of this?